This issue goes out as I'm speaking at An Event Apart in Orlando. It's been my first experience of a Disney Park - that's been interesting in itself! The news this week is that Grid Layout has gone to Candidate Recommendation, so we are a big step closer to having it available in browsers. Unsurprisingly there has been a lot more buzz online about Grid, I've tried not to entirely fill this email with Grid Layout stuff though. We've also got pattern libraries and style guides, SVG and responsive images. So hopefully something for every interest. Last week CSS Grid Layout transitioned to Candidate Recommendation status. I wrote a post to explain what this actually means for the specification. I have posted the first set of videos in what I intend to be a comprehensive introduction to the CSS Grid Layout specification. Some interesting tips demonstrating how SVG is much more than just an alternate image format. I love this post from Matt Hinchliffe, a front-end developer working on the Financial Times. He has take the layout patterns using on the FT website and demonstrates how they would be created using Grid. My talk at View Source Conference in Berlin contrasted grid and flexbox, it is an introduction to both specifications - their similarities and differences. A quick tip on the justify-content property as part of SitePoints A-Z of CSS series. The videos from Clarity, a conference about pattern libraries and style guides, are now available free on SitePoint. If you are interested in the move to using style guides and pattern libraries as deliverables and as a way to keep your projects consistent there is some good stuff here. A thorough article explaining how to automate "art directed" crops for responsive images. "Any time we alter our images visually to fit a different context, we’re “art directing.” A resolution-adaptable image will look identical everywhere — it only resizes. An art-directed image changes in visually noticeable ways. Most of the time, that means cropping, either to fit a new layout or to keep the most important bits of the image visible when it’s viewed at small physical sizes." A page that shows the percentage of users who have a browser natively supporting various web platform features. 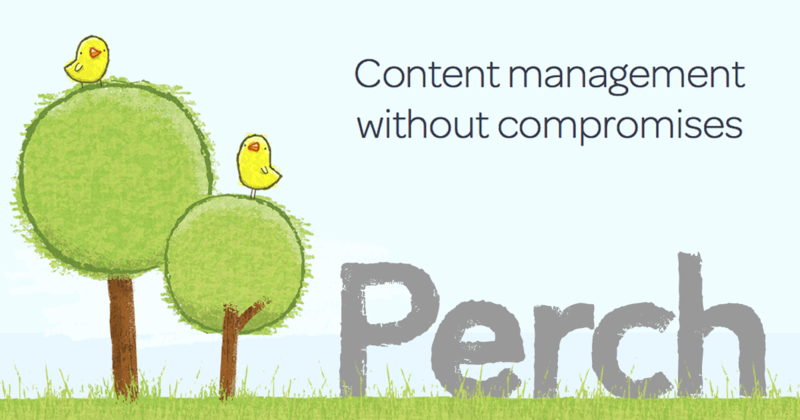 We believe that content management systems should manage content really really well, and leave the design and front-end code to you. That's why when you use Perch or Perch Runway you have full control of everything the CMS outputs. Use any framework you like, or your own carefully crafted HTML and CSS. Output to JSON instead of HTML? No problem at all! And with our focus on performance your site should be super-fast too!